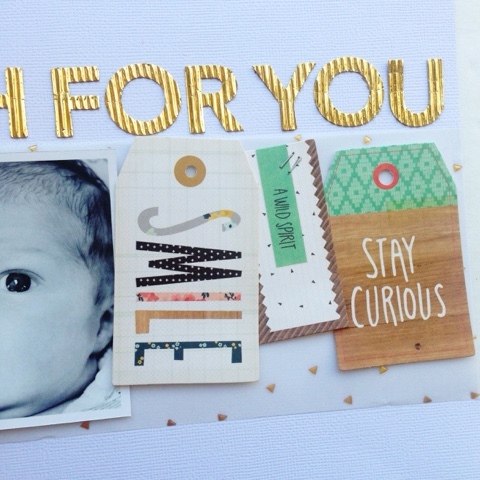 There is a spotlight on Crate Paper's new line, Wonder, on the Paper Issues blog today. 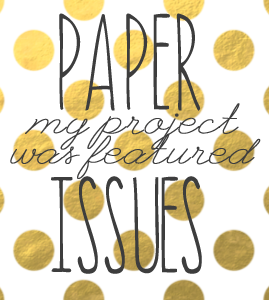 You check out the projects the other design team members made. They really rocked this line! 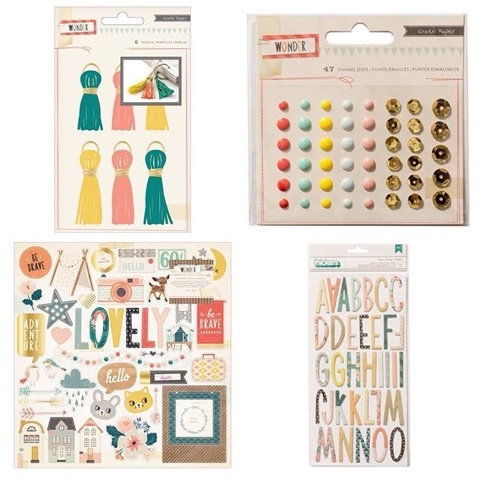 One of my favourite things from any Crate Paper line is the die cut ephemera pack. As I was flipping through the Wonder pack, I was struck by all the tags and cards with words like "dream", "stay curious"and "smile". 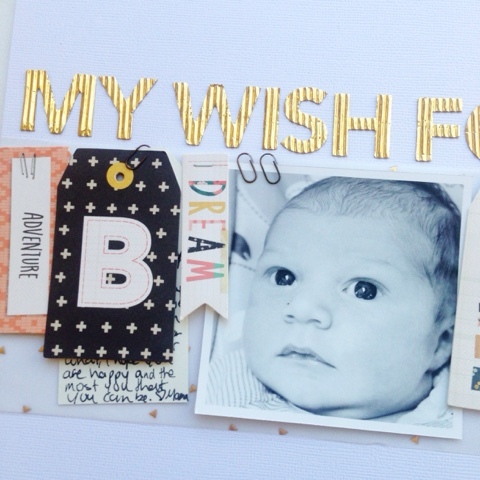 I knew that I wanted to use them to make a layout about things I wish for my son. I ran the die cuts along the page like on a clothes line, wit my photo in the middle. I backed the whole line with the gold triangle vellum. I tucked a white shipping tag behind another tag with a paper clip, to keep it a little hidden. I just love those gold corrugated Thickers. I definitely should have bought more than only 1 pack. Wonder is definitely up there as one of my favourite Crate lines right now. It is just so whimsical and sweet. These are my four favourite items from the line (1), (2), (3,), and (4). 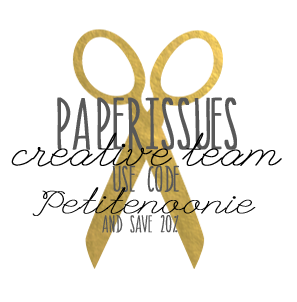 You can use my code 'petitenoonie' to save 20% off your entire order in the Paper Issues shop. Love this LO! I need to use this collection! I write articles in a French magazine, named "Passion Scrapbooking". 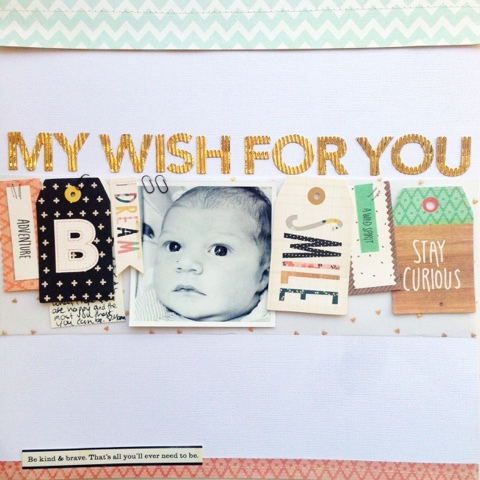 My current subject is " festive elements (glitters, balloons, garlands...) on scrap layouts ". Do you accept that I use a photo of your creation (here : http://petitenoonie.blogspot.fr/2015/04/happy-happy-birthday-girl.html) to illustrate a part of the subject? Your name (or pen name if you prefer) will be quoted of course next to the image, and the brand if you realize it for a brand if necessary ! If yes, could you please send me as soon as possible one or several good quality photos? Thank you for answering me quickly, even if it is "no", because I must have ended my article very soon.